Alright, so life is (too) busy, but since necessity is the mother of many inventions, a new style of post seems better than no post at all. So we bring you a Friday Chemistry Fix, hopefully the start of a number of occasional posts on experiments you can do at home, with only a little bit of chemistry to help you understand what you are seeing. Safety: You will only use things you are likely to find around the house already, but that should not make you complacent. Vinegar is an irritant and if it gets in your eye or on an open wound, it will sting and should be washed out immediately. Kitchen cleaning sprays are usually a mixture of compounds and irritant to eyes and skin; because they are sprays, they can also irritate you airways and they should most certainly not be swallowed. Mine comes with a whole range of safety instructions on the bottle, so read the label, avoid inhalation and contact with eyes and skin. And if contact occurs, wash thoroughly with water. Finally, it might surprise you if you have cooked with it, but turmeric can also cause irritation to skin, eyes and your airways, so you should avoid breathing in the spice, as well as avoiding skin and eye contact. Ideally, wear gloves and safety specs (people will take you more seriously that way, too), but at the very least use small amounts and wash immediately if you get anything on your skin or face. Pay attention to safety information on the things you use. Work space and activity: Turmeric can leave yellow stains, so try to find a work surface that is unlikely to become stained – I used my stainless steel kitchen sink, but a glass surface protector would also work. I certainly would avoid working over a carpeted area or on unfinished wood, have a cloth or kitchen roll to hand and, if it’s a kitchen worktop that ends up with a bit of a stain, the kitchen cleaning spray may well be useful to get this off. Avoid spraying kitchen cleaner at people and ensure good ventilation. And finally, if you break anything, take care not to cut yourself while picking up the pieces and wrap them in newspaper before disposal. 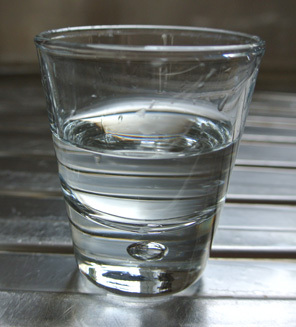 Step 1: Put some water into your glass/cup. You don’t need a lot, I used a half-full shot glass. 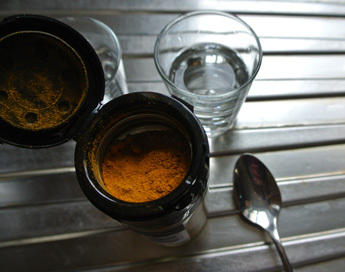 Step 2: Use a teaspoon to add a small amount of turmeric spice to the water and give it a good stir. Little will dissolve, but it should colour the water yellow. 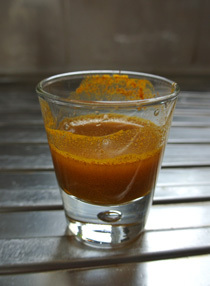 Turmeric in water, after a stir. 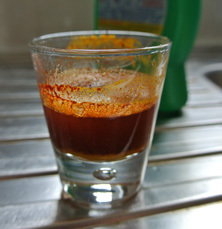 Step 3: Spray 1-2 squirts of your kitchen cleaner into the turmeric solution in the glass. What do you observe? Step 4: Once you have observed a colour change, add a little vinegar to the solution and see if you can return it to the original colour. 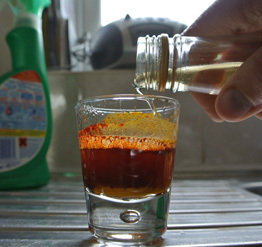 Adding vinegar (hand – photographer’s own). Gradual colour change, this takes a moment. Step 5 (Optional): Do your best scientist laugh, cackle or snigger because you have just observed some cool chemistry. Step 6: Wash your solution down the sink with lots of water and clean up after yourself. Turmeric contains a compound called curcumin, which is a naturally occuring indicator (there are others, see this link for example). Indicators are molecules that change colour depending on the pH of a solution (there is a bit more about acids in our post on rhubarb, and plenty of resources around the web about pH, starting with Wikipedia), and for curcumin, this means it is yellow in acidic and neutral solution (up to pH 7.5), and red above (to about pH 8.4). 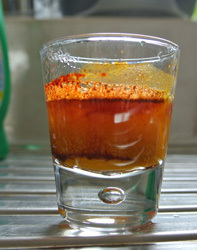 The kitchen cleaning spray I used is basic with a high pH (the older word is alkaline), so spraying it into the water changes the pH of the the solution, it becomes more basic, causing the colour change to the red form of curcumin. 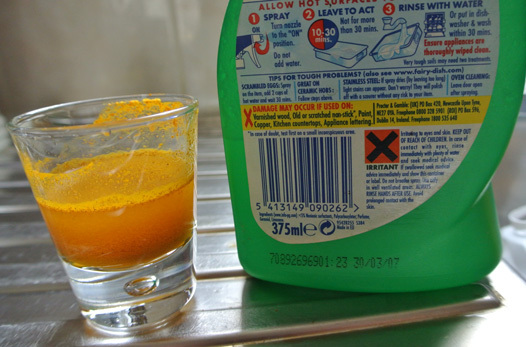 Adding vinegar, which is a weak acid, makes the solution acidic, so the yellow form of curcumin dominates again. And you can even observe a gradual colour change as it takes a bit of time to mix and react. The two forms of curcumin. 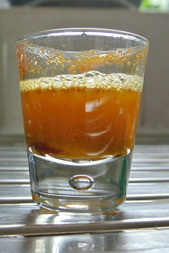 Yellow (left) below pH 7.5, red (right) above. Categories: Colours, Cookery, Food, General | Tags: chemistry, cleaning product, cooking, cucurmin, food, rhubarb, science, spices, turmeric, vinegar | Permalink.